A funny thing happened to me at St. Ann's Warehouse in December. I came to a new understanding of a play I already knew well: Measure for Measure. I know that's what some people always say--that seeing Shakespeare's works again and again rewards them with fresh insights and a tighter grasp on the complex course of his art. It's a fundamental article of faith, recited in grant proposals, course syllabi, and government policy papers. I've believed it myself and professed it with devotion. But when it actually happened last month at a visiting production from London's Globe Theatre, directed by John Dove, I realized how rarely I feel such an exhilarating surge of discovery while watching a canonical play. Suddenly my long-standing convictions seemed merely rote, even hollow. Too often, performances of well-known works give off "a sporting event quality," as the director Brian Kulick has put it. I take him to mean that we engage the familiar play wondering: Will the director call for a bunt where we would have done so? Will this Hamlet hit a home run? We watch to see where the production will line up with -- or challenge -- what we already think. Along the way, it might send up some sparks of a bright idea (the centrality of "poison" -- and the homology with "prison," for instance -- in the Hamlet Kulick recently directed at the CSC, starring Michael Cumpsty). A particular actor might make some strong choices that put events into sharp relief (Andrew Weems's gruff and mangy Thersites, who personified the rot in the martial myths of Troilus and Cressida in Peter Hall's production for Theater for a New Audience.) Most often these days (these last several decades, really), an overarching metaphor might hammer a primary theme (the abattoir setting with its hunks of hacked meat in Edward Hall's Rose Rage--his visceral version of the Henry VI trilogy.) In the end, though, we simply assess the impact of such innovations against our own interpretation of the play, on the basis of which we can say whether the new notions "worked." But they haven't moved us experientially, suddenly to see the whole with new acuity. The Globe's Measure did. It all came together with a small gesture in the last scene--as the Duke, Mark Rylance (the Globe's departing artistic director) closed his eyes, pressed his hands to his breast and held his breath. He was making a wish. Or offering up a prayer. Mariana had just asked Isabella to kneel with her to ask the Duke to revoke the death sentence he had pronounced against Angelo. "Against all sense you do importune her," the Duke tells Mariana (the woman who had been betrothed to Angelo and took Isabella's place in the bed trick.) But she tries again. And the Duke stands firm: "He dies for Claudio's death." But in the beat after Mariana's implausible request -- which foreshadows the one that will follow the Duke's abrupt marriage proposal some 50 lines later, as I realized for the first time in this moment -- the Duke squeezes his eyes shut and hopes against hope. And he opens them, quietly letting out his breath, when Isabella pleads, "Let him not die." That the Duke silently yearns for this outcome -- rather than either guiding it or being shocked by it, as the scene is often played -- unlocks the emotion in the action and propels the play toward the surprising satisfaction of its overly tidy ending. Isabella's act of grace, her unselfconscious excess of generosity, feels thrilling and the Duke's reaction guides us to experience it as such. He looks at her with wonder and covers his face with his hands, as though weeping. No wonder he impulsively asks for her hand. The multiple marriages of the final scene, unwished for as they may be in some instances, offer the formal shape of a comedy. But the comic sensibility comes from Isabella -- and the Duke's elated response to her-- because her choice gives credence to the Duke's faith in human goodness. Most critical responses to the production's multi-city U.S. tour misidentified the source of its vitality and sense of possibility. 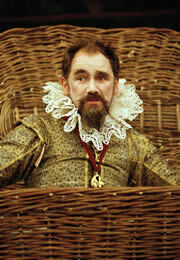 The reviews emphasized Rylance's portrayal of the Duke as a bumbler, improvising in his friar's disguise as he seeks to save Claudio from Angelo's iron rule. Certainly Rylance exploits the comedic current in the role -- even making a Falstaffian entrance in a laundry basket at one point. But this is not a matter of merely playing for yuks. Rather, Rylance's Duke genuinely seems to be confused by the contradictory demands of paternalistic governance: to "love the people," as he says, and also to enforce "the needful bits and curbs to headstrong jades." That his own trusted deputy turns out to need reining in most of all seems to confound him further. He seems lost, too, inevitably so, in the play's world of binary absolutes (liberty/justice, whoring/chastity, rigidity/charity, nature/law, and so on). 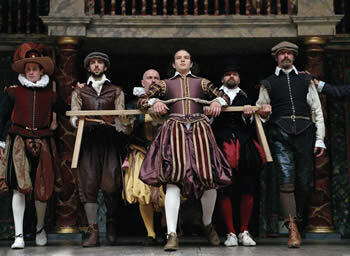 Addled by running from one pole to the other, Rylance's Duke creates some middle ground to stand on. These values register because of the production's overall clarity and energy -- themselves products of the company's famous "original practices" approach: bare thrust stage, pageantry and music provided by live performers, natural lighting, an all-male cast. The point isn't to make a fetish of "authenticity," but to take Shakespeare out of the illusionistic frame that shapes our post-proscenium viewing habits and to focus attention on the actors and their language. Here the bodies before us and the words they utter create all the effects. We not only listen more keenly as a result; we also experience multiple meanings and ironies more organically. The dance that ends the performance is the most invigorating example. The Duke has just untangled all the knots and paired off the couples for impending marriages -- though Isabella is famously silent in response to his own proposal -- and he pronounces the rhyming lines that close the play, leading everyone off in a processional exit. His retinue, with their period oboes and viols, strike up a jaunty tune and the company arrays itself into position for a court dance of hopping steps and little kicks. The play itself is clearly over -- these are actors now, enjoying themselves, not characters in a restored realm. Yet when Edward Hogg as Isabella shoots Rylance a smile a few bars into the dance, it's as if her selflessness and her belief in the human capacity to become better bestow grace on us all.